Today's projects is one of my favorites! We found this gorgeous Henry Link Dresser at an estate sale, and it is just amazingly beautiful. 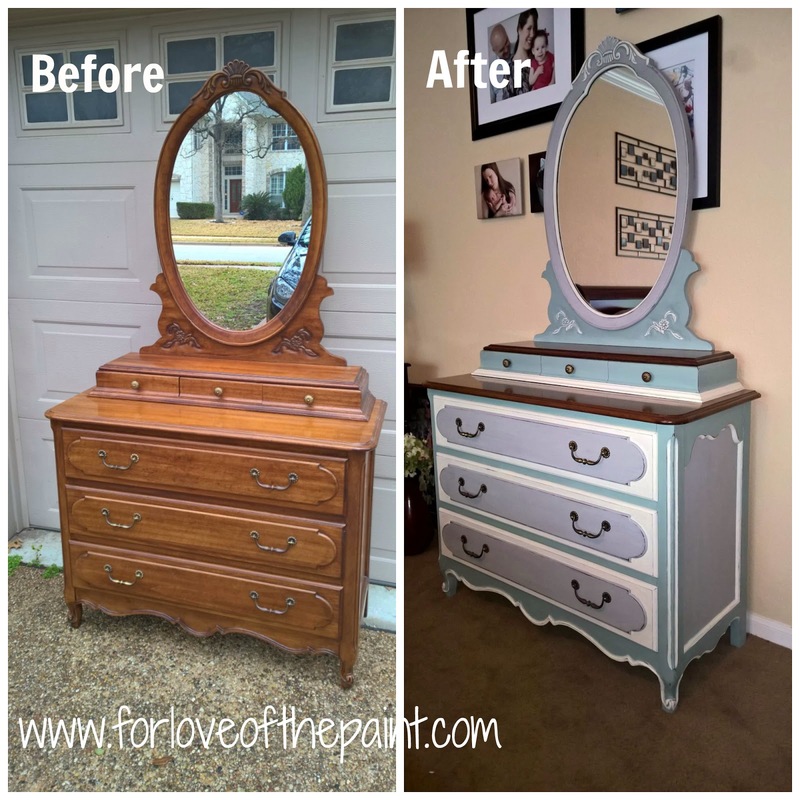 I kept the original stain on the dresser and vanity tops to make it feel more grounded and neutral, but added Annie Sloan Chalk Paint in Paris Grey, Duck Egg, and Old White for a super lovely color combination! Yummy, right? I put Paris Grey over the whole shebang, then dry-brushed Duck Egg over the body, and used Old White for the trim. I distressed the high points and around the drawer faces to finish the vintage chic / shabby chic look. I love the completed look, especially with the hardware patina! Curious about my inspiration? The absolutely stunning light-and-cloud interplay of blue, white, and gray! Here's a sweet side-by-side with a photo taken on our Montana trip last year. There's a reason they call it the Big Sky State, y'all! That is so stunning! I would have never thought you could create such a beautiful dresser from what was in the before picture! Thanks, Christine! 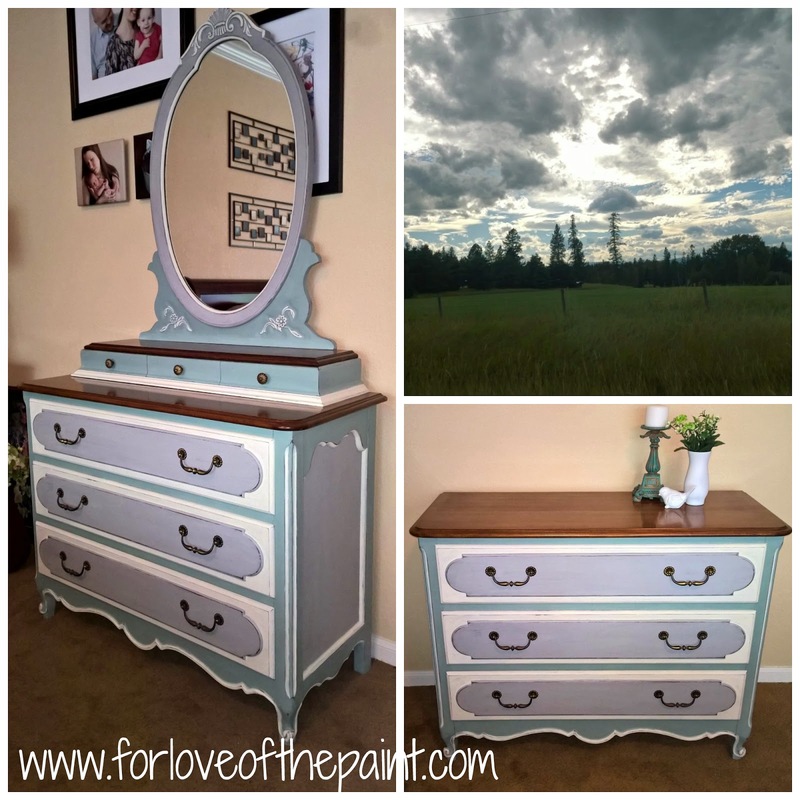 I loved the structure of the original dresser, and was super excited to get to play with these great colors :) It's hard to tell that the stain on the tops as well as the drawer pulls are actually original - they look entirely different next to the paint update!